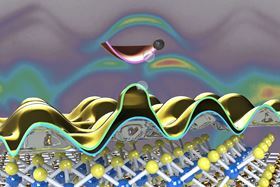 This rendering shows the atomic structure of tungsten disulfide (‘ball-and-stick’ representation at bottom) and the signature (middle and top) of the electronic properties that were observed using an X-ray technique at Berkeley Lab's MAESTRO beamline. Image: Søren Ulstrup/Aarhus University, et al. To see what is driving the exotic behavior in some atomically thin – or two-dimensional (2D) – materials, and to find out what happens when they are stacked like Lego bricks in different combinations with other ultrathin materials, scientists want to observe their properties at the smallest possible scales. Enter MAESTRO (Microscopic and Electronic Structure Observatory), a next-generation platform for X-ray experiments at the Advanced Light Source (ALS) at the US Department of Energy's Lawrence Berkeley National Laboratory (Berkeley Lab), that is providing new microscale views of this weird 2D world. In a paper published in Nature Physics, researchers report using MAESTRO to zero in on signatures of exotic behavior by electrons in a 2D material with microscale resolution. The new insights gleaned from these experiments show that the properties of the 2D semiconductor material they studied, called tungsten disulfide (WS2), may be highly tunable, with possible applications for electronics and other forms of information storage, processing and transfer. Those applications could include next-generation devices spawned from emerging fields of research like spintronics, excitonics and valleytronics. In these fields, researchers seek to manipulate properties like momentum and energy levels in a material's electrons and counterpart particles to more efficiently carry and store information – analogous to the flipping of ones and zeroes in conventional computer memory. Spintronics, for example, relies on the control of an inherent property of electrons known as spin, rather than their charge. Excitonics could multiply charge carriers in devices to improve efficiency in solar panels and LED lighting. Valleytronics would use separations in a material's electronic structures as distinct pockets or ‘valleys’ for storing information. The signal the researchers measured using MAESTRO revealed a substantially increased splitting between two energy levels, or ‘bands’, associated with the electronic structure of WS2. This increased splitting bodes well for the potential use of WS2 in spintronics devices. WS2 is already known to interact strongly with light. The new findings, coupled with its previously known properties, make it a promising candidate for optoelectronics, in which electronics can be used to control the release of light, and vice versa. "These properties could be very exciting technologically," said Chris Jozwiak, an ALS staff scientist who co-led the study. The latest research "in principle shows the ability to change these key properties with applied electric fields in a device." "The ability to engineer the features of the electronic structures of this and other materials could be very useful in making some of these possibilities come true," he added. "We are right now at the brink of being able to study a huge variety of materials, and to measure their electronic behavior and study how these effects develop at even smaller scales." The study also suggests that trions, which are exotic three-particle combinations of electrons and excitons (bound pairs of electrons and their oppositely charged counterpart ‘holes’), could explain the effects they measured in the 2D material. Holes and electrons both serve as charge carriers in the semiconductors found in popular electronic devices. Researchers used a form of ARPES (angle-resolved photoemission spectroscopy) at the MAESTRO beamline to kick away electrons from samples with X-rays and learn about the samples' electronic structure from the ejected electrons' direction and energy. This technique can resolve how the electrons in the material interact with each other. "There are very few direct observations of a particle interacting with two or more other particles," said Eli Rotenberg, a senior staff scientist at ALS who conceptualized MAESTRO more than a decade ago. It was built with the goal of directly observing such ‘many-body’ interactions at a level of detail not possible before, he said. "This is what we were going for when we built the MAESTRO beamline." MAESTRO, which opened to scientists in 2016, also features several stations that allow researchers to fabricate and manipulate samples for X-ray studies while maintaining pristine conditions that protect them from contamination. MAESTRO is one among dozens of X-ray beamlines at the ALS that are specialized for samples ranging from proteins and vaccines to batteries and meteorites. In addition to MAESTRO's precise measurements, the careful preparation of the tungsten disfulfide flakes in sufficient size for study, and their transfer to a base material (substrate) that didn't impede their electronic properties or obstruct the X-ray measurements, were also vital for the success of the latest study, Jozwiak noted. "Two-dimensional materials are extremely sensitive to their surroundings, so it's imperative to fully understand the role of any outside disturbances that affect their properties," said Jyoti Katoch, a research scientist at The Ohio State University and lead author of the paper. Katoch worked with Roland Kawakami, a physics professor at Ohio State, in preparing the samples and designing the experiment. They coupled samples of WS2 to boron nitride, which provided a stable, non-interacting platform that was crucial for the X-ray measurements. Then they used a metal as an ‘external knob’ to modify the properties of the WS2. "This study enables two critical breakthroughs: it provides a clear fundamental understanding of how to remove outside effects when measuring the intrinsic properties of 2D materials, and it allows us to tune the properties of 2D materials by simply modifying their environment," says Katoch. Søren Ulstrup, an assistant professor at Aarhus University in Denmark who had worked on the WS2 MAESTRO experiments as a postdoctoral researcher, added: "Seeing the intrinsic electronic properties of the WS2 samples was an important step, but perhaps the biggest surprise of this study emerged when we started to increase the number of electrons in the system – a process called doping. "This led to the dramatic change of the splitting in the band structure of WS2," he said, which suggests the presence of trions. MAESTRO can handle very small sample sizes, on the order of tens of microns, noted Rotenberg, which is also a key in studying this and other 2D materials. "There's a big push to resolve materials' properties on smaller and smaller scales," he said, to better understand the fundamental properties of 2D materials. Scientists are now working to extend MAESTRO's capabilities so that it can study even smaller features – down to the nanoscale. There is accelerating research effort on stacking 2D layers to tailor their properties for specialized applications, Jozwiak said, and MAESTRO is well-suited to measuring the electronic properties of these stacked materials too. "We can see a very explicit impact on properties by combining two materials, and we can see how these effects change when we change which materials we're combining," he said. "There is an endless array of possibilities in this world of '2D Legos', and now we have another window into these fascinating behaviors."